FREE Father Of The Year Gift Set! Are you thinking of the last minute gift for Father’s Day? Here’s the answer! Grab this FREE Father of the Year Gift Set for new TopCashBack members! Complete with a USA made Superior Grade Shaving Cream, Ice Cold After-Shave Balm, and a full-size Lip Protectant, it’s the ultimate gift for Dad. Plus, this is a bonus triggering deal for you! Spend at least $11.04 or more via the custom TopCashBack page and get an additional $5 sign-up bonus on top of the $11.77 cash back. That makes this a $16.77 FREEbie! 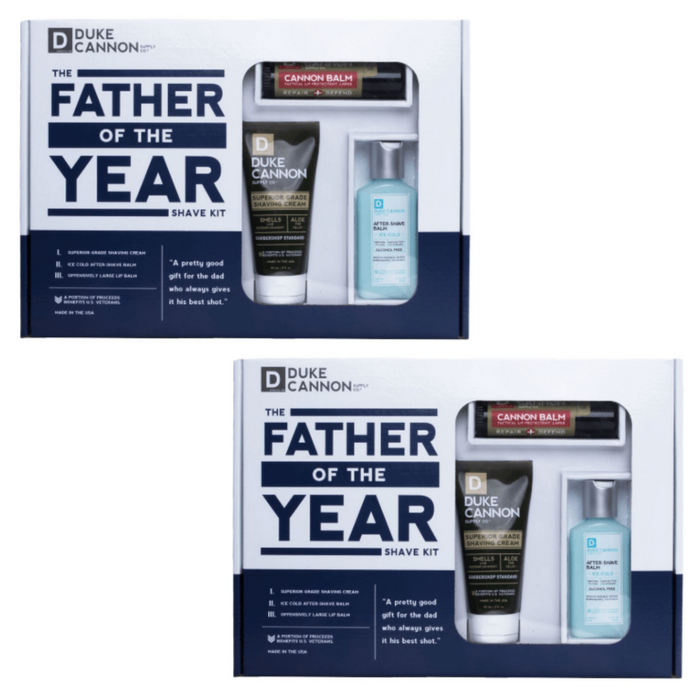 Add the “Father of the Year” Gift Set for $11.04 or more to your cart from Target and head to checkout. You must spend at least $11.04 to get this deal. Pay $11.04 or more. That’s it! The $11.77 will post to your TopCashback account within 14 days, and the amount will become payable within 14 days. Cash back can be credited straight to your checking or PayPal account. Note: Transactions must contain at least $11.04 worth of purchases to ensure the $11.77 cash back is credited to TopCashback accounts. Transactions may initially track lower, but within the 14 days after purchase it will be uplifted and turn payable at the amount of $11.77. Transactions may take up to 7 days to appear in your TopCashback account. The deal is open until 11:59pm PST on 6/15/2018 or until supplies run out; whichever happens first; applicable for purchases made directly after clicking through TopCashback. Only one TopCashback account is permitted per member. ShedRain’s Father’s Day Gift Guide! Stumped for a good gift idea for dad this year? ShedRain’s got your Father’s Day gifts covered with the newest innovations in umbrellas–new to the market just in time for Father’s Day. Whether dad’s into the latest in tech, loves the luxe life, or likes to spend his ‘free’ time wandering the great outdoors, these gifts will bring happiness to his next rainy day. Check out ShedRain’s newest innovation in the umbrella industry with the fully automatic E-Motion. This new motorized umbrella is the first to not only close the canopy, but also slide it all the way down to the handle – in one motion with the push of a button. The battery powered umbrella can be recharged with the USB connector included in the handle of the umbrella with one charge lasting a full 150 openings and closings! If you’re looking for the perfect gift for the techy dad, or golfing dad, or the dad who has everything this may be your ticket! ShedRain brings together luxury, artisanal craftsmanship and superior engineering to create the new status-defining Stratus Collection (winner of the Red Dot design award). Stratus is composed of 250+ individual, quality parts, hand assembled, and created from new molding that was specifically crafted for this ultimate “affordable luxury” piece. The Core technology is defined by a TrilobeTM shaped profile deployed into both the shaft and ribs for superior torque and strength. The design is reinforced with the finest precision Aircraft Aluminum and Fiber Reinforced Polymer frame, a Zinc Alloy chrome detailed handle and fine fabrics coated with Teflon®. A patented Flange (small disc at the base of each umbrella) protects umbrella tips from catching on fingers, clothing and other items. A removable handle strap makes it versatile and easy to carry on-the-go. Built to withstand hurricane force winds, the new Vortex Vent umbrella features innovative technology and design including the new Anti-Inversion Strut system combined with the highest quality components. MSRP $75.00. Available April 2017. We would love to work with you to include ShedRain in your Father’s Day gift guide. Please let us know if you’d like any additional information, hi-res images, or product samples. ShedRain Vortex Vent Pro from ShedRain on Vimeo.